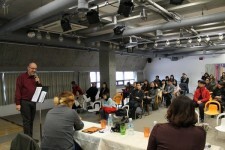 On January 18th, at the WCO (World Culture Open) Centre in Seoul. Along with the Korean photographer K.Chae. Each of us presented his work and we answered together to the questions of the public. K. is shooting in a very colourful style, as I am more Black and White oriented, but despite the differences, the encounter revealed a same deep love for photography and humanity, and the share of what is most important in street photography : the feeling, the moment, the heart.. and not the camera.